Show yourself thus his decided superior. Weep that you cannot Americanize him! Has he a houseful of children? O, my! What an example of gross impropriety! Out on a menace like this to society? How can we hope to enlighten his mind? What can we do if the prudent despise him? Where for such families a home can we find? How can we hope to Americanize him? What of his background and what of his race? What of his culture inherent or national? Relevant they to a matter so rational. This is the way to Americanize him. Between 1880 and 1924, over 25 million immigrants came to the United States. With this influx of immigrants came concern over America’s lax policy towards immigration and assimilation. Until the start of the 20th century, Americans typically believed in the power of the “melting pot” to create a common culture out of the various groups coming to America. However, this surge in immigration made Americans uneasy because immigrants were creating their own communities in mining towns and city centers, relying on their languages of origin to communicate, and celebrating the customs of their homelands. Many Americans questioned the allegiance of these immigrants, especially at the outbreak of World War I. Thus, Americanization was imagined, with reformers hoping to accelerate immigrants’ adaptation to the dominant social, cultural, and political practices to become ideal citizens (Burkholder, 2010). In May 1915, the National Americanization Committee was established to unify all peoples as Americans, regardless of where they were born (Hill, 1919). While Americanization programs are now viewed as disciplinary and unnecessarily coercive, at the time they were considered progressive, liberal, and kind because Americanization sought to ease immigrants’ transitions into the United States (Burkholder, 2010). This is exemplified in the National American Woman Suffrage Association’s December 1917 Bulletin titled, “Americanization as War Service.” In this article, the National American Woman Suffrage Association asserts that in times of need, it is important to feed, clothe, arm, and educate not only American citizens, but also allies, such as the “foreign” population.” Yet, the bulletin also warns suffragettes, “do not lose your identity as the Americanization War Service Department” (Adèle Goodman Clark papers, Collection # M 9, James Branch Cabell Library, Virginia Commonwealth University). Americanization sought to eliminate any visible marker of difference between Americans and immigrants. Settlement houses, factories, labor unions, and public schools became the battlegrounds for both promoting “100% Americanization” and connecting immigrants to necessary resources as they learned to navigate their new communities. Some notable companies and organizations involved in the Americanization efforts included the Ford Motor Company, the Y.W.C.A., the Sons and Daughters of the American Revolution, and the National Council of Jewish Women (Freeman, 2003; Reynolds, 1921). In fact, public schools were expanded and received more funding in the early 20th century primarily for this purpose (Burkholder, 2010). As described by Henry Hervey in the 1920s, legislatures around the United States adopted measures to ensure English as the language of instruction in schools. Minnesota, for example, mandated that classes be “taught in the English language, from text-books in the English language, and…by teachers qualified to teach in the English language.” While foreign languages could be taught as electives, foreign languages were not allowed to be spoken for more than one hour per day (Hervey, 1920). Schools were effective sites for Americanization because they were able to mold children in their formative years, instructing them in English language, American history, and democratic processes. Moreover, many public schools were adapted into night schools for adults who wished to better their English and obtain American citizenship. In the 1920’s, however, these more practical lessons designed to enhance vocational and technical education were paired with moral education, hoping to mold immigrants’ ethical values to that of the “true” American. Referred to as “character education,” this moral curricula required students to memorize lists of moral traits and values which reformers believed to be absent in immigrant communities. These values included honesty, hard work, punctuality, cleanliness, and respect for authority (Burkholder, 2010). 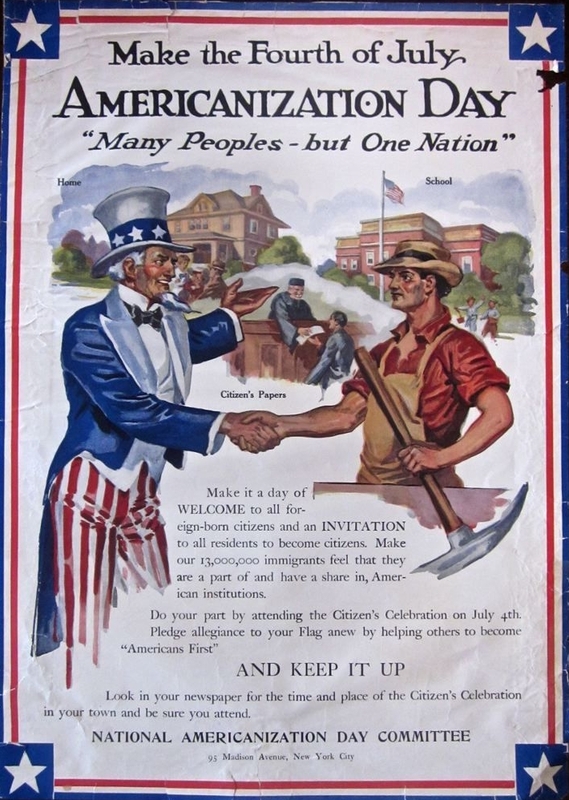 Heightened xenophobia and nativism reached a head in 1924, resulting in immigration restriction, alleviating what many saw as the need for Americanization campaigns. In the 1930s, however, a new wave of reformers emerged. 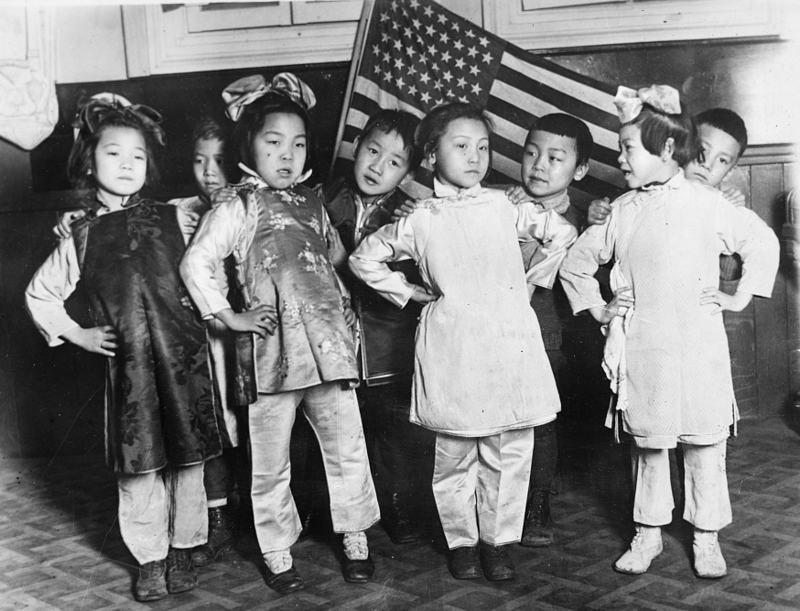 These reformers criticized the repressive assimilation programs, and instead promoted “inter-cultural education,” which sought to celebrate the unique cultural gifts of different immigrant groups. Yet, the ultimate goal of this inter-cultural education was still to ease the assimilation of immigrants into the majority culture.This program was ultimately unsuccessful; at the outbreak of World War II, politicians wanted national unity. Thus ended the Americanization campaigns in schools, leaving a legacy of European immigrants being integrated into dominant white society, while non-white minority groups endured continued discrimination (Burkholder, 2010). True Americanism. Address of Louis D. Brandeis at Faneuil Hall, Boston. July 4, 1915. Kallen, Horace M. “Democracy vs. the Melting Pot: A Study of American Nationality,” The Nation, 100, no. 2590. February 18-25, 1915. Adèle Goodman Clark papers, Collection # M 9, Special Collections and Archives, James Branch Cabell Library, Virginia Commonwealth University, Richmond, VA.
Burkholder, Z. (2010). Americanization. In T. C. Hunt, J. C. Carper, T. J. Lasley, & C. D. Raisch (Eds. ), Encyclopedia of Educational Reform and Dissent (pp. 60-61). Thousand Oaks, CA: SAGE Publications. Freeman, R. (2003). Libraries to the people: Histories of outreach. Jefferson, NC: McFarland & Company. Hervey, H. D. (1920, June 24). Americanization. The Journal of Education, 91(26), 712-713. Hill, H. C. (1919). The Americanization movement. American Journal of Sociology, 24(6), 609-642. Meyer, S. (1980). Adapting the immigrant to the line: Americanization in the Ford Factory, 1914-1921. Journal of Social History, 14(1), 67-82. Roy, J. R. & Wollever, H. F. (1922, January 5). Wise and otherwise. The Christian Advocate, pp. 24.